Guity Novin graduated from the Girl's College of Fine Arts with an honours diploma in 1965, she was admitted in the Institute of Decorative Arts in 1970 and received her BA in graphic design. She exhibited her works at Negar, and Sayhoon galleries, and participated with the artists of Salon d' automn of Paris in an international exhibition inaugurated by president Jacques Chirac, then the Prime Minister of France. She moved to the Hague, Holland in 1975, exhibited her works at Nordeinde and followed her studies at vrije acadmie voor beelende kunsten. In 1976 she relocated in Manchester, England where she continued her studies and exhibited at Didsbury. After successfully entering a U.K.-wide competition for exhibiting at London's E.C.A Exhibition at the National Theatre in South Bank she migrated to Canada in 1980. In Canada Guity Novin has exhibited at Galleries in Kingston (Brock), Ottawa (Trillium, and Artex), Montreal (Sherbrooke), and Toronto (Christopher Hughes, One of A Kind). In a series of exhibition since 1996, she has inaugurated Transpressionism, which is described by Paula Pieault-Stein as "a new movement in paintings that transcends beyond Impressionism and Expressionism styles" and which "awakens a sagacious insight bearing on the inner world of appearances" [The Globe and Mail, 11 Feb. 1996]. Since 1997, as part of a two year exhibiting tour of the west coast, she has moved to Vancouver, and is now exhibiting her Transpressionist works at Guthenham Gallery in Granville island. Guity Novin works are in private and public collections in England, Germany, France, Netherlands, Canada, USA, Iran, Israel, Argentina, Brazil, Mexico, Australia, and New Zealand. 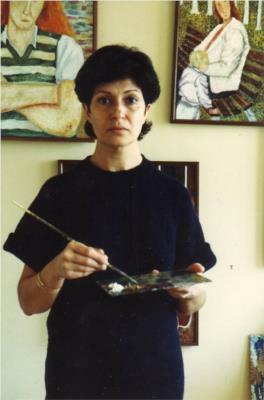 Guity Novin (born Guity Navran, 1944) is an Iranian-Canadian figurative painter, and graphic designer residing in Canada. She classifies her work as Transpressionism, a movement she has introduced. 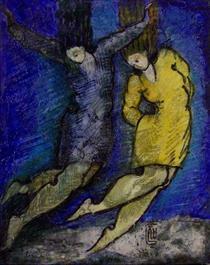 Her works are in private and public collections worldwide. She has served on a UNESCO national committee of artists. 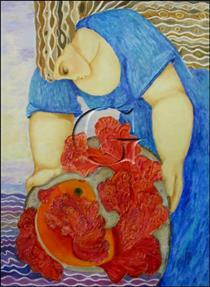 Guity Novin was born in an educated middle-class family in Kermanshah. Her family were originally from the northern Iranian city of Bandar Anzali. Her father Abdol-Rahman Navran was the only son of Abodl-Rahim, a ship owner and sea merchant in the northern Iranian port of Anzali (Bandar-e Anzali) in the Caspian Sea. He traded between ports of Baku, Lankaran and Astara in Azerbaijan. In the early 20th century the Caucasian region became a major geostrategic center and one of the important theaters of World War I. After the October Bolshevist coup and civil war in the former czarist Russia, the Red Army conquered Baku in 1918, the navy of the White Army took refuge in the Anzali Port, which was under the control of British forces. The Red Navy conquered the port of Anzali in 1921 and confiscated Abdol-Rahim's ships. These events financially ruined Abdol-Rahim as he soon lost his capital and watched his business collapse. Seeing no prospects of recovery, the young desperate businessman committed suicide. His young son Abdol-Rahman was raised by his Navran grandparents, and was separated from his young mother, who soon was remarried and gave birth to another son Djavad Bani-Yaghub. After finishing high school, sought independence Abdol-Rahman found a job in order to be independent. He was offered a post at the Iran Customs, and was sent to work at its branch office in Ghasr-e Shirin, a border post with Iraq. Abdol-Rahman who learned to play accordion, spent his weekends at Kermanshah, where he fell in love with a sister of one of his colleagues, a local beauty by the name Molook Kashefi. Soon after they met, he proposed and she accepted. Together they had four children, Guity, who was the eldest, Kamran, her brother, and her two younger sisters Jaleh, and Jila. Meanwhile, Abdol-Rahman brought his mother and his younger brother to live with him. His mother never left him again. In the spring of 1953, the Navran family moved to Tehran. Those were tumultuous years for Iran, the nationalist Prime Minister, Dr.Mossadegh, had nationalized the oil industry in 1951, and now the confrontation between Iran and Britain have escalated to the extent that the Iranian government refused to allow the British any involvement in Iran’s oil industry, and Britain was making sure that Iran could not export any oil. Mossadegh had stopped negotiations with Anglo Iranian Oil Company [AIOC] and the British government had announced a de facto blockade of Iran and reinforced its naval force in the Persian Gulf and lodged complaints against Iran before the United Nations Security Council. On 4 April 1953, CIA director Dulles approved a plan to oust Mosaddegh. The plot, known as Operation Ajax, succeeded and Mosaddegh was ousted. During these turmoils, the young Guity was hearing an array of disturbing news without being able to make much sense of them. For instance, she overheard from adults that the head of Police had been kidnapped and was tortured to death, this had frightened her enormously. My Women Guity Novin ? Wonderful World Guity Novin ?